An annually-recurring professional meeting has started to put me in interesting DX locales. 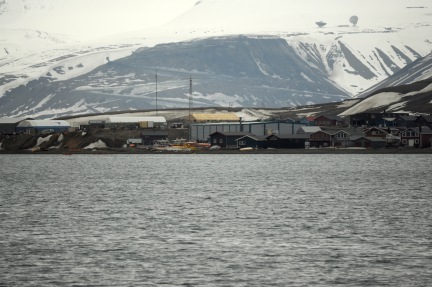 This year was no different: the meeting was held at UNIS (University Centre in Svalbard) in Longyearbyen, Svalbard. My friend and colleague, Nathaniel, W2NAF, did a semester of his graduate studies at UNIS and was excited to return for the meeting. 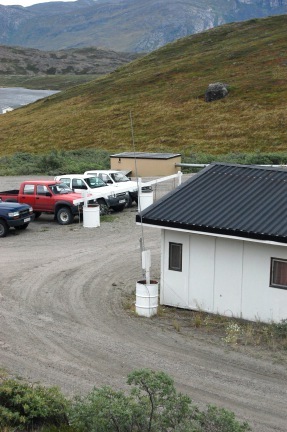 He suggested that the JW5E clubstation “hut” (depicted below) might be both an attractive lodging option for cost, location, and of course, radio. The hut is a bit rustic with no running water but we did manage to maintain a nearly professional level of appearance and personal hygene due to Nathaniel’s insider knowledge. 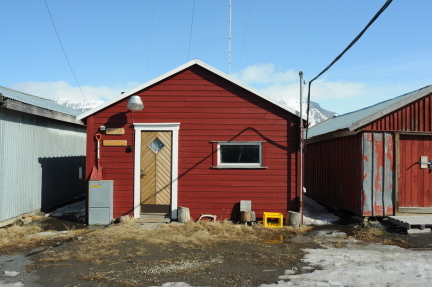 As is typical for the kind of travel I do, there was no straightforward way to get from A to B. Nathaniel and my flight schedules put us into Longyearbyen (via London, Oslo, and Tromso, in my case) on Friday and Saturday, respectively, giving us a shot at the CQ WPX CW contest. We elected to operate this under our own callsigns, which proved to be a bit of a limitation since for much of the contest 20 meters was the only band that produced rates. So, we had to share 20m. 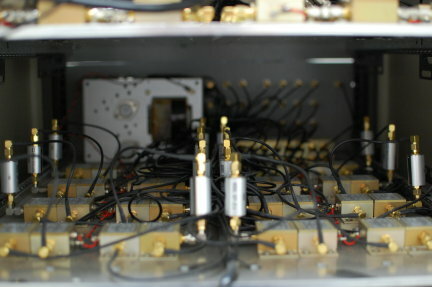 Nathaniel operated high power using the JW5E FT-1000MP mkV and Icom IC-2KL amplifier connected to the JW5E antenna system. I operated low power with my K2/100 and the JW5E antennas. He came out a little bit ahead on QSOs and pretty far ahead on points, mostly due to the day of head start and effectively exploiting 20m. I also worked a lot of empty-calorie EU stations while he focused on 3-pt DX stations. Despite our initial optimism, neither of us were particularly dedicated to a full effort in the contest. We both had a bit of trouble adapting to polar day and slept through prime openings on Sunday. 40 meters and lower frequency bands were useless, as were 10 and 12 meters. Nathaniel and I did work each other on 160 with the power turned all the way down. And, of course we worked each other in the contest for an easy prefix multiplier. The 12m situation was a little disappointing since I know a lot of people needed JW there. Had we been there in March, it probably would have been open. I worked two CTs and that’s it. During the week of the meetings, I only managed 1-2 of hours operating each day, and Nathaniel maybe a little more. We developed a protocol of uploading to LoTW first thing in the morning when we got to the meeting (where we had free network access, versus roaming 3G on my phone at JW5E). Since I don’t use ClubLog, this is a good way for DXers to see if they’re in the log and get a quick confirmation. As I told a DXer who thanked me profusely for doing it, my employment covers the largest costs of my DX travel and my operating is secondary to my work. Therefore, I feel no need to extract or solicit donations from DXers. I am ordering cards today and they will be ready to mail in a week or two. On the last night, I put in a solid 6 hours of operating, making about 600 QSOs in one sitting. 30m was always a struggle with most signals right near the noise level. The other bands (15/17/20) produced big signals and were pretty easy to work. I’m always a bit slow to operate split because I don’t want to use more bandwidth than necessary. With an amp, I could probably have operated simplex most of the time. Usually once people stop coming back to my 599s or they start duping me mercilessly, I know it’s time to split the pile. The pileups were generally very responsive to my instructions with only one station really raising my blood pressure to the point that I QRT’ed to cool off. Based on his QRZ.com profile and how loud he was compared to all the stations he was obliterating, he was running as much as 4 kW on 30m. Good show. I heard that someone on a DX club e-mail list suggested that I go next to Jan Mayen (JX). Please negotiate that with my wife and we can work something out. 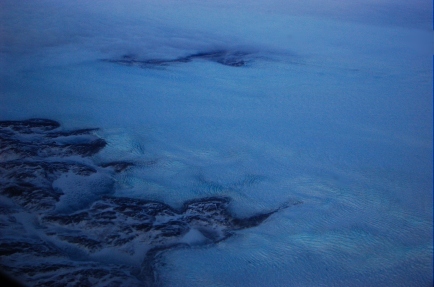 Don’t forget to include that Jan Mayen has one flight per month. My Norwegian colleagues were amused by this and asked also about Bouvet (3Y). Only scientists and hams know about Bouvet and Jan Mayen. Seriously, if I didn’t have a young family, I would consider doing that sort of thing, but I miss them too much when I travel. The next DX trip will be someplace warmer with regular commercial air service. The real stars of this operation were the Etymotic Research MC5 in-ear monitor earphones. Wow. I’ve been using them for a couple of months now at the recommendation of someone on the Elecraft reflector and they are my new favorite headphones for travel. They do excellent with noise isolation on long-haul flights and in noisy QTHs; they reproduce music flawlessly; you don’t have to turn the volume up to 11 to hear with them; and they fit in a tiny little pouch that’s smaller than a deck of playing cards. And the best part? They only cost 60 USD. The GU Special came along on this trip but was not needed since I had access to an OptiBeam for 20/17/15 meters, dipoles for 30/40/80, and a Cushcraft R7 vertical for 40-10 meters. I was tempted to take my gear on the 8-hr boat trip we took up another fjord. 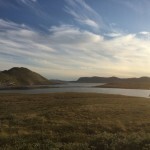 However, I decided against it for a variety of reasons including the desire to do some birdwatching and look for polar bears—we saw some seals and an artic fox but no bears. The seals and the fox amounted to no more than a couple of pixels in the photos I tried to shoot of them, even with a modest 200mm telephoto lens. OK, that’s a short lens by wildlife photo standards. 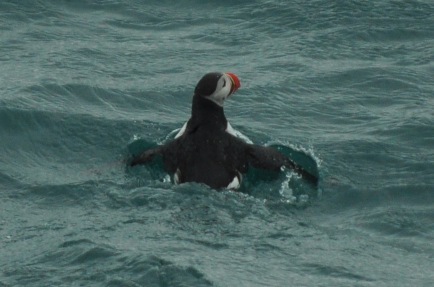 Please accept this puffin photo in place of a bear photo. This photo is looking back up Adventfjorden toward Longyearbyen and shows the JW5E tower right near the water in the center. (The heftier one on the right.) 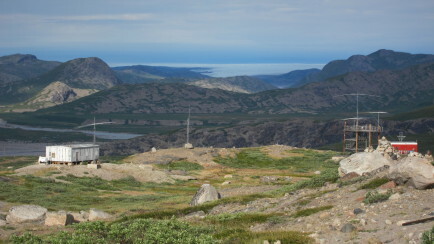 Also in the background are the dishes for the EISCAT Svalbard incoherent scatter radar. 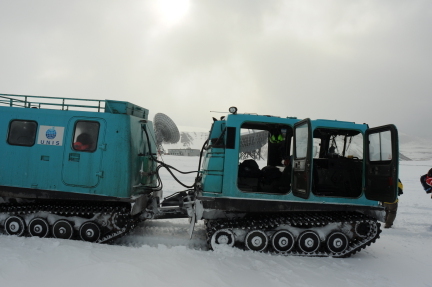 And a photo from our visit to EISCAT in tracked vehicles. It was practically June and there was a lot of snow on the ground. Finally, here are two YouTube videos related to our operation. The first was shot by W2NAF and has a tour of the JW5E station. The second was shot by KB9UWU during the WPX contest and shows pretty much what 15m was like for me: the band was obviously open but I didn’t have many callers. Thanks to everybody who stopped by to say hi. I worked lots of friends on the air from all over the world and received SWL reports from a few more. 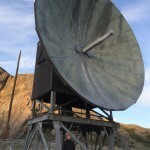 A professional colleague who is the principal investigator of the Sondrestrom incoherent scatter radar facility announced at a conference that they no longer had a scientific high-rate GPS receiver at the site for making ionospheric measurements. I enthusiastically volunteered to ship them one that I had on the shelf. She suggested that instead I should come install it myself and I found some support to do it (the National Science Foundation heavily subsidizes U.S. Greenland and Antarctic scientific travel during their respective summers, making this trip possible). Therefore unlike my previous trip in the winter, this trip did not involve travel with the most perverse of arrangements flying to Copenhagen only to hop on another plane and fly half-way back to the States. 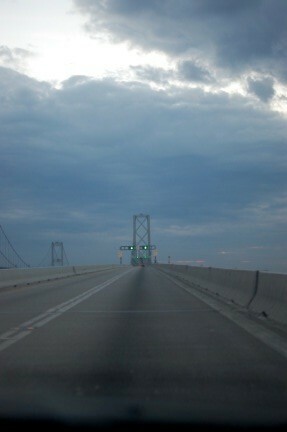 I set off for my second trip to Greenland, leaving Scotia, NY, early on Monday and returning mid-day on Friday. 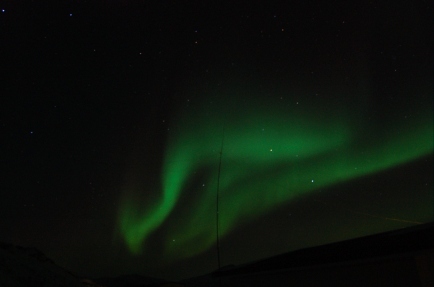 On the past trip, conditions were really awful for radio with plenty of visible Aurora. I didn’t really mind that because the auroras were beautiful, but with only a small chance of NLC/PMC (noctilucent/polar mesospheric cloud) sighting in the summer, I was eager for some good radio conditions to sate my appetite for other nerdy activities. I set up the radio equipment almost right away the first evening to make sure that everything tuned up and immediately made 10 or so QSOs on 20-meter CW before heading to bed. Instrument installation is always a hairy business, especially when you can’t just run to a hardware store, let alone going to RadioShack or calling McMaster-Carr. Sometimes, everything works smoothly; other times it doesn’t. In any case a flexible attitude (and some good old ham practicality) goes a long way. Wind gusts of 40-50 mph (18-22 m/s) on top of the hill made for exciting work, but having a couple of helpers made it go smoothly. 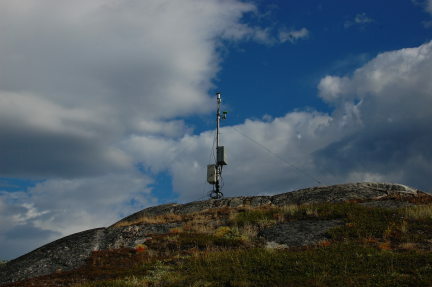 Here is a photograph of the installed instrument on its hilltop (the box and green antenna on the right-hand side of the pole, which also held a weather station). Work, especially some recalcitrant Windows 7 issues (At one point, I was running Windows 7 in a VirtualBox virtual machine on a Linux machine and logging into the Linux machine from a Mac! ), kept me pretty busy on Tuesday and Wednesday and I only managed a few minutes of operating on each of those days. But, by Thursday, my schedule broke loose a little and I was able to operate for a few solid hours in the afternoon and evening. I had no idea that Greenland would be so popular on 30 meters! Wow. That’s definitely the most intense pileup I’ve ever experienced. Thanks for being patient. There was some about S3 hash on 20 and 30 meters that the K3’s NR function would take care of but the NB function wouldn’t. NR is not good for running pileups, so I often had to get the caller isolated to use NR. 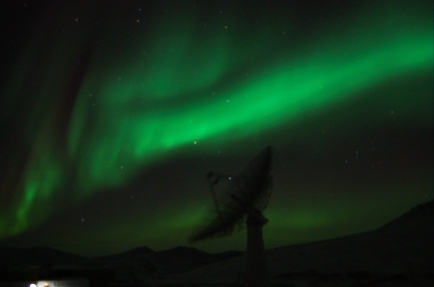 On the receiving end, there was a lot of fast QSB, with a period of a few seconds (this is consistent with magnetospheric and plasmaspheric waves that impinge upon the auroral and subauroral regions.) In any case, callers were up and down, often in the span of a call. You all on the other end may or may not have observed the same from me. Per usual, the setup was an Elecraft K3 and the GU Special vertical with 2x 1/4-wavelength radials for each of 20 and 15 meters. 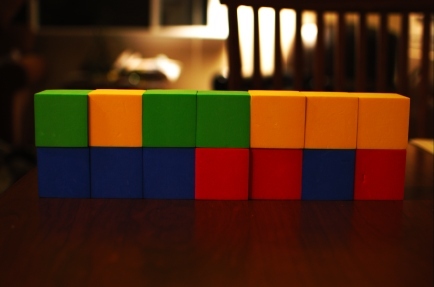 Everything else was tuned by adjusting the length of the radiating section. This is a substantial improvement in performance-to-size ratio over the previous station I carried in January 2012, which was a Yaesu FT-840, DK9SQ 10-meter telescoping pole, and a variety of wire antennas. Below is a photograph of the GU Special deployed (it’s in the center, unceremoniously ty-wrapped to a wooden sign post sticking out of a barrel). The diesel Toyota HiLux pickups are the most popular vehicle in town. We gave a visiting graduate student lessons in driving a manual transmission. Great vehicle to teach/learn on with lots of torque and low gearing! Thanks for the QSOs. The log has been uploaded to LoTW this morning and QSL cards are ordered. I never ordered cards after the last trip, so it will be a shared card with a photograph of the aurora. 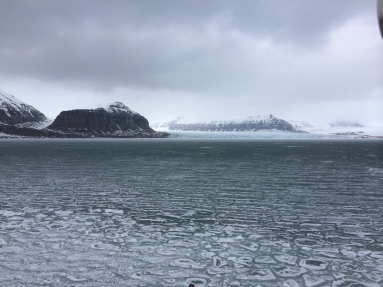 Loyal readers know that from time to time, I am fortunate to travel to interesting and exotic locales for work—they usually come in pairs, so Greenland and Peru are it for a while. Although the motivation is usually field work, occasionally a conference pops up. The International Symposium on Equatorial Aeronomy occurs every three to four years and can be counted on for an exotic locale. Sarah had such a good time when we attended the 12th ISEA in Crete in 2008 that she insisted on attending the 13th in Peru with me this year. Of course, Evan complicated that a bit, and so we evaluated the pros and cons of leaving him with grandparents or bringing grandparents along, eventually finding a willing pair of grandparents to come along. If you’re interested in a general travelogue (and following posts) and some photographs, you might check out my father’s blogs. 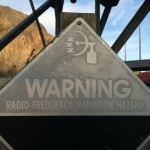 This short post is mostly focused on radio aspects of the adventure. 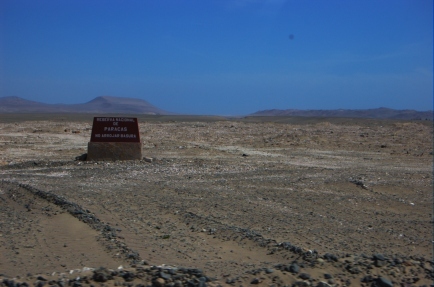 Paracas, which is about four hours’ drive south of Lima, was the site of a major earthquake several years prior and is still in recovery. The hotel that hosted the conference and a few nearby hotels had all been rebuilt from the ground up since the earthquake. The city is on a small bay that is protected from the Pacific. It’s very beautiful—desert sands that go right down to the bay. After a few days at the meeting, I managed to get the antenna set up. One of the things that surprised me was an excellent JA opening on 20 meters just after sunrise before I went to breakfast and then the meeting. I am pretty sure it was a direct-path opening because the signals did not sound like long path and the long path crosses the southern auroral oval, whereas the direct path does not. (Auroral absorption, by the way, is one reason that the long path can be more effective than the short path.) Any time I called CQ as OA5/K8GU, I was greeted with a roaring pileup. Not bad for an antenna propped up on my veranda. Verticals on the beach rule, and this one wasn’t even really on the beach. At the request of a friend, I made a special effort to operate on 12-meter CW in the afternoon. 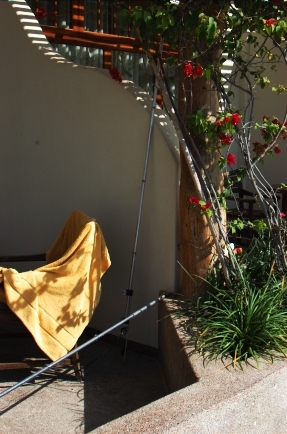 The portable antenna would not tune up on 12 meters with the wire radials I had laid out. In a moment of desperation, I assembled some extra pieces of my portable antenna to produce a tuned radial that I clip-leaded to the ground lug as depicted in the photo above. It worked right away and I was quite popular there as well. 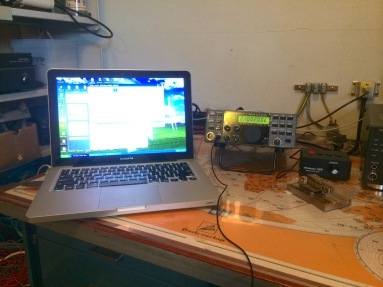 A comment about computers—my standard work-issued computer is a MacBook Pro, which although perfect for my work, is essentially useless for amateur radio. I know this will generate a torrent of discussion, but if you are accustomed to real contest/DXpedition logging software available for DOS and Windows, you know that the stuff for the Mac doesn’t cut the mustard. I have logged DX operations on paper (CE/K8GU), or in the case of the OX/K8GU operation, brought along a second computer. However, in a long-delayed flash of insight, I bought and installed VMware Fusion on the Mac in February. It runs Windows XP and TR4W with the WKUSB just brilliantly and with no special configuration. Aside from having to press Fn+F1 to CQ, this was an epic win. KB9UWU tells me that there’s an option in VMware to eliminate this nuisance as well. After the meeting in Paracas, we returned to Lima, where we celebrated the 50th anniversary of the Jicamarca Radio Observatory. 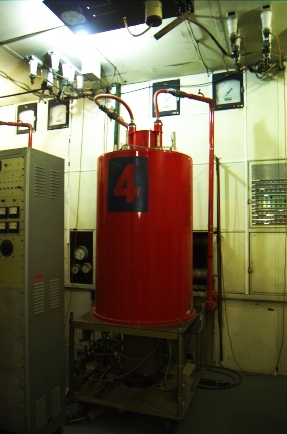 The cornerstone of the Jicamarca facility is a 49.92-MHz radar that feeds an 18,720-element phased array, pictured above. 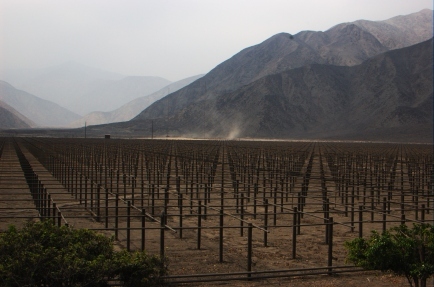 Jicamarca is one of the most powerful radio transmitters in the world, capable of 4.5 MW output, and is used for a variety of atmospheric, ionospheric, and space science experiments. Like Arecibo, it was originally designed to perform incoherent scatter measurements of the ionospheric electron density profile. Lots of fire in that wire! 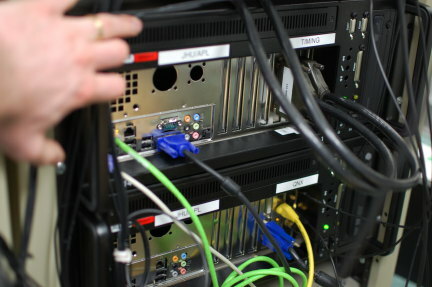 Have you ever seen a coaxial cable that’s rated for over a megawatt at 50 MHz? This is the feedpoint of the phased array. There are a few tuned stubs in there, too. 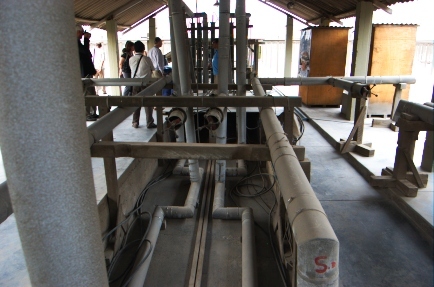 Here’s one of the four 1.5-MW transmitter cavities. A maximum of three are used together. When configured for three transmitters, the driver stage puts out 7 kW! Needless to say, everything is custom made on site. The transmitting tetrodes (8973s, if I recall correctly) are refurbished by the manufacturer as needed. After Jicamarca, we went to Cusco, which is south and east of Paracas, and much more lush than the deserts around Lima and Paracas. A final thought—we drove through a lot of towns and communities in OA4, OA5, and OA7, on this trip. Nearly every town, no matter how small, had at least one building with an HF fan dipole on the roof. 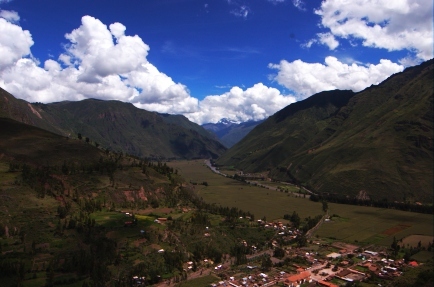 HF is alive and well in a mountainous country like Peru! QSL information: If you worked OA5/K8GU or OA7/K8GU, the best way to get a confirmation is through ARRL’s Logbook of the World. I have been responding to direct cards (to my FCC address) with a one-day turn-around lately. 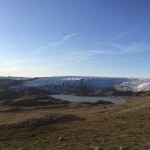 Greenland is only a short (4- to 6-hour) flight from the NE U.S., however the only route that operates in winter (and indeed the only commercial route) is on Air Greenland via Copenhagen, which operates four round-trip flights per week in winter. This turned getting there into a two-day affair of perverse travel arrangements totaling over 12,000 air miles to go about 4200 miles round-trip on the great circle. 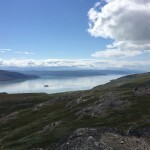 I met my co-worker, a United Airlines devotee (myself an American Airlines devotee), in Copenhagen and we flew to Kangerlussuaq (Sondrestrom) on Air Greenland. 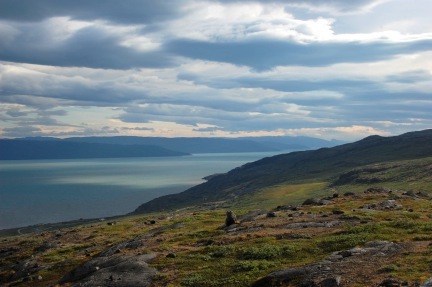 One of the things that strikes you about Greenland as you approach Kangerlussuaq is how otherworldly and remote it is. 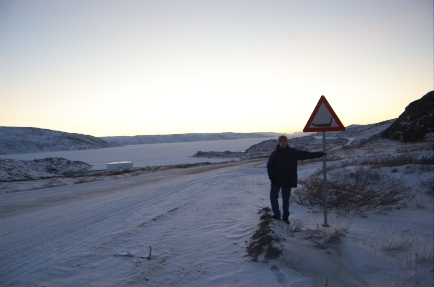 Kangerlussuaq is the site of the former U.S. Sondrestrom Air Force Base, and one of two runways (the other is at Thule) on the island large enough to accommodate aircraft capable of flying to Greenland from abroad (this is a mild, although amusing exaggeration). 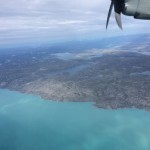 Air Greenland has its hub there, shuttling passengers off to towns around Greenland on twin-engine turboprops like the Dash-8. 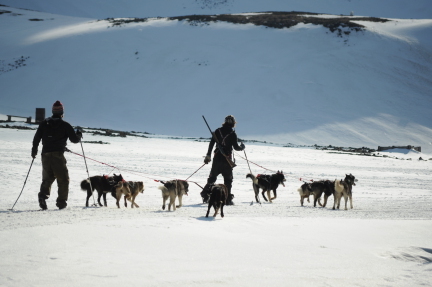 It is, as our host explained, “…not your typical Greenland town. 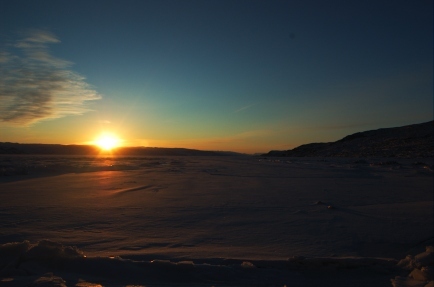 It is far inland at the end of the fjord and not on the coast. The only reason it exists is because of the airport.” Fuel and supplies are all brought in from outside. Like most current and former U.S. military installations worldwide, it is reliant on diesel fuel for its on-going existence. It’s sobering to be someplace that is totally unsustainable, although one might argue similarly of many U.S. cities, but I digress. 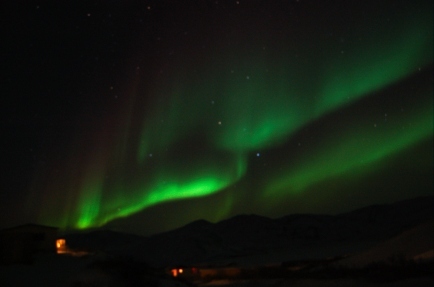 The second night, I stood “aurora watch” in the cold while my warm-blooded co-worker processed the previous night’s data. 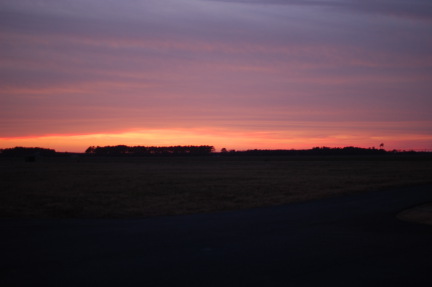 Soon, I saw some faint cloudy white sheets way down on the horizon and I ran back in to alert him and retrieve the camera tripod. 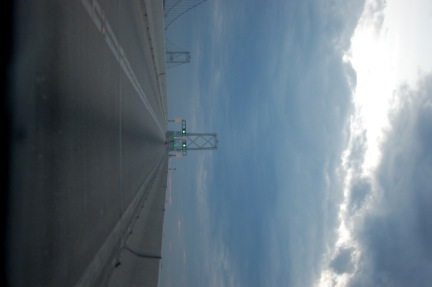 This photograph was taken facing toward the east southeast. 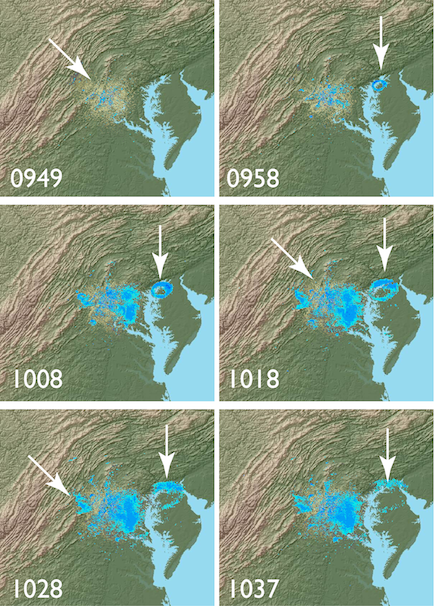 And, the 3.5-MW peak L-band incoherent scatter radar was running. The dish is blurred because it is moving. And, here is a shot of my fan dipole strung up on the DK9SQ mast. Speaking of radio, I did manage to make a few QSOs as OX/K8GU on 17 meters, but not as many as I would have liked. The combination of high absorption in the auroral oval (mostly to our south during our stay), little sunlight, a poor low-angle shot (required to avoid the auroral zone) to North America, short openings, and the fact that we were well-occupied with work for the four days we were there conspired to keep my contact count low. QSOs will go into LoTW soon—the certificate was issued yesterday. I have not yet designed a card, but there will be a special card. Thanks to those who did contact me.